Edmund calls himself a “reformed freelancer." He’s played all the roles – he’s been a client, a freelancer, and a manager. He’s trying to take all that he’s learned and create an efficient project management system that can be applied to consultants and clients alike. Being a freelancer, you learn a lot of things the hard way. Management is not an easy task. Managing your time can be just as difficult as managing a team if you don’t know what you’re doing. In order to start managing client projects effectively, it’s best to recognize that these systems and processes are bigger than you are. Trying to manage on a scale this big is where Edmund excels, and he shares how he uses technology to make the process more practical. We’re all pretty overwhelmed with tasks these days. So we’re trying to find a way to make it easy for everybody involved. You don’t want to rely on technology too much, but it can be useful when it comes to organizing projects and communicating with clients. There are thousands of apps and tech tools you can use to manage projects, but Edmund finds that not everything is compatible. What works for your team may not work for a client, or vice-versa. Edmund is in the process of developing his own software platform that can be used across projects, team members, and lifestyles. Edmund shares the steps he takes with clients in order to get them from start to finish with a project. You may have a system in place for yourself, but introducing a client to your process can be a mess if you aren’t prepared. You don’t want to be too transparent with clients. You just want to give them enough information to keep them in touch with their project. Deciding how transparent to be can be a problem for new freelancers, especially when technology is involved. If you’re inviting a client to any one of those platforms, it’s very difficult to get them to only see what they need to see. Essentially, from our perspective…we’re kind of giving them the recipe for how we do these things…We’re unveiling the process. To avoid giving away all of your secrets, Edmund recommends creating a timeline for your clients. It is not a matter of dumbing things down for them, but rather keeping them informed of your process. Clients like to know where they stand, so giving them cues can make it easy for them to track your progress and stay on top of deadlines. As Edmund and his team are building their new platform, they are incorporating ways to keep clients involved in the project. Create the experience based on where they’re at in the process. Otherwise, you’re showing them too much and they don’t actually know what they need to do next. Don’t overwhelm your client with irrelevant information. Keep things to a minimum and give clients a little flexibility. Two business days is Edmund’s typical timeline for reviews and edits. He doesn’t like to hold up the assembly line, so to speak. And a little leniency can help you avoid difficult clients who don’t respect your time. Edmund’s insight goes beyond just client work. Because managing projects can be more than just you and the client. Sometimes you need a team of contractors or assistants to help you meet your goals. His work requires subject matter experts, so Edmund has a lot of experience finding and hiring freelancers from all over the internet. The best people are not always in the area where you’re located. Edmund shares the best places to look for skilled freelancers, both locally and online. He breaks down his vetting process and how he uses a star system to rate new hires before officially hiring anyone permanently. His advice is to always give freelancers a buffer in case you need more time to give feedback or request rewrites. Both clients and freelancers work better when they have extra time, and scheduling this extra time into your project management process can really protect your reputation. If you’re not efficient, then your business will never grow. Edmund warns of this and explains how and why project management can make or break your freelance career. 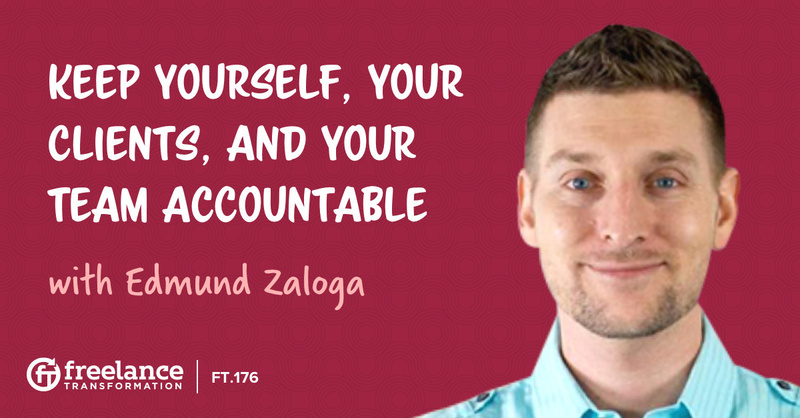 He shares what it’s like when these processes fail (because they can) and what you can do to bounce back from a particularly bad client project. When you’re a freelancer, everything is a learning process. Don’t be afraid to fail, but you can avoid some common mistakes by listening to the advice Edmund is sharing on this episode.